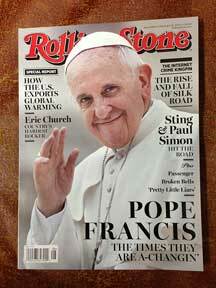 FRONT ROYAL, VA — Father Federico Lombardi, director of the Holy See Press Office, has called the Rolling Stone's recent cover story on Pope Francis superficial, negative, and crude. "The Times They Are A-Changin'" the title preens. And all change is "progress," right? As we all know from the history of the past 100 years or so. But two things haven't changed: first, the truths of the Catholic Faith; and second, the Rolling Stone's superfried brain, fossilized in amber, laced with cocaine, and buried in the knee-deep mud of Max Yasgur's farm near Woodstock, New York back in 1969. The title borrows from a memorable Bob Dylan tirade calling on sons and daughters to rebel against their faith and their fathers. Well, we know where that got us. From there the Stone careens downhill: unlike his backward predecessor, Francis is in tune with the revolution, ready to embrace the Me Generation's narcissism, self-indulgence, and arrogance, if only he lives long enough. Hmm. As the Italians say, stronzata. In 1972, The Temptations sang "Papa Was a Rolling Stone," a ghastly tale of a deadbeat womanizer (not Bill Clinton — he shows up later) whose early drug-induced death left his family destitute. That "Papa" embraces all of the Stone's heroic virtues. Not ours. The Woodstock generation thought it was cool to "getcha picture on the cover of the Rollin' Stone." No, the Stone's treatment merely exploits Francis' popularity, hopeful that their cover picture will attract the unaware to their lies inside. The contempt can't wait: "After the disastrous papacy of Benedict…." There they go again. Ah yes, that "staunch traditionalist who looked like he should be wearing a striped shirt with knife-fingered gloves and menacing teenagers in their nightmares." Naturally, Francis "seemed a small miracle to the average Catholic" after Benedict Scissorhands, right? The article's author, whom we will generically label "Stonehead," continues with the usual drivel. His idea of the "average Catholic" is apparently somewhere between Nancy Pelosi and Rembert Weakland. Meanwhile, the pope, a secret ally of the Gay Lobby, adroitly avoids discussing gay marriage, birth control and abortion. After all, they're merely "divisive social issues," not objective moral evils. ...the Stone's treatment merely exploits Francis' popularity, hopeful that their cover picture will attract the unaware to their lies inside. Predictably, Stonehead wraps them in Francis' Papal Motto, "Who am I to judge," implying that he's as ethically unhinged as the Stone's editorial board. Next, the mandatory Social Justice rehash. "Astonishingly" (Stonehead is shocked, shocked! ), Francis "devot[es] much of his first major written teaching to a scathing critique of unchecked free-market capitalism." Un-astonishingly, Stonehead didn't read it. Less than ten percent of Evangelii Gaudium, Francis' Apostolic Exhortation, is devoted to the economy. And even less to economics. The word "capitalism" never appears in its 52,000 words. Pope Francis did write there that "economic growth, encouraged by a free market," cannot "by itself succeed in bringing about greater justice and inclusiveness in the world." We all know that. Only by embracing Jesus Christ can the world make that happen. Here's another flash: "Open dissent, of course, is a rare thing in an organization as hierarchical as the Catholic Church." Not to worry. 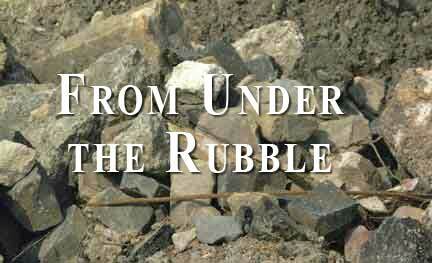 The fearless Stonehead has pounded the pavement and risked his career to find one of those "rare" dissidents. Guess which one he found. Yes, Stonehead gratefully channels one of America's most self-promoting dissenters – fresh from a Jesuit magazine, no less, and now "a senior analyst at the left-leaning National Catholic Reporter," a prominent bastion of the Gay Lobby in the United States. It had to happen — and Stonehead is not alone. Throughout the country, media outlets are downsizing, offering buyouts, or just firing people. Often the first to go are the "Religion" reporters. The "Culture" editors are next. Enter Father Thomas Reese, S.J., bragging to a dazzled Stonehead that Cardinal Ratzinger (that ogre, remember) got him fired from his last job. The enterprising Father Reese has assembled a digital Rolodex of all those distraught, overworked writers and editors and offers his expert advisory services to them, free of charge. "He sends backgrounders every week or two," one religion reporter told me. "He promises to call back right away on his cell if I'm on deadline, and assures me that he won't be upset if I don't quote him by name." Wow, undergrads! Do you have a term paper due? Call yourself a reporter, and call Father Reese! As Tom Lehrer sang, "Plagiarize, plagiarize, plagiarize! But be sure always to call it — research!" "The election of Francis took him [Reese] completely by surprise," writes Stonehead. "He hadn't expected to see another pope who created such hope for the church." Still spiteful after all these years, Father? Well, Benedict is arguably the most brilliant theologian alive. It is disappointing, but not unusual, that lesser lights should envy him. One of this remarkable pontiff's greatest gifts to the Church was his Motu Proprio that restores the rights of all priests to celebrate the Tridentine Mass (now the "Extraordinary Rite"). Father Reese is unimpressed. He has a different view of the Eucharist. In 2010, Tom Bethell attended a lecture by Father Reese in San Francisco (which once stood for "Saint Francis," as I recall), where Joe Biden's support for abortion came up. Biden's critics insist — and Canon 915 requires — that our brother Joe be pastorally advised to mend his ways and, in the meantime, to refrain from the scandal of receiving Holy Communion. Father Reese did not agree. He elicited a "gleeful burst of laughter" from the "upscale Catholic audience" when he referred to Biden's critics as "wafer watchers." Bethell adds wryly that, "of course, for those who don't believe the Communion host is anything more than a wafer, obsessing about who consumes it really is a joke." With critics like these, who could like Pope Benedict? Stonehead's prose soars: "controversial hypertraditionalists," members of Opus Dei (Tremble! Tremble! ), and "ultraconservative American Catholics" — all, no doubt, advocates of insidious intrigue (why, they even go to Confession — a Sacrament shrouded in the "seal" of secrecy!). Stonehead rattles off a few more secular headlines – Francis is a closet Liberation Theologian; he has "sacked" Raymond Cardinal Burke; a "group of nuns" (all two of them – on George Soros' bus, remember?) don't like Rep. Paul Ryan. He then conjures up a few headlines of his own: Juan Peron was a free-market capitalist, and, while Father Reese is free to dissent from the Church's magisterial teachings, we are all morally bound to agree with his opinions regarding welfare-state legislation. Father Lombardi is right. Stonehead is negative and superficial. And his wrap-up is crude indeed. During the press conference on the the way home from the World Youth Day in Brazil, he writes, "a reporter attempted to pin Francis down on gay marriage and abortion. "And what is His Holiness'own position on these matters? The pope's artful dodge struck me as brilliantly Clintonian. 'That of the Church,' Francis said simply. 'I'm a son of the Church.'" "The Church has already expressed herself perfectly on this. It wasn't necessary to return to it, just as I did not speak about fraud or lies or other things about which the Church has a clear doctrine." Pope Francis emphasized the point again in his America interview: "The teaching of the Church, for that matter, is clear and I am a son of the Church." Hey, what difference, at this point, does it make? The Stone considers it an honor that a mere cleric should be compared to the world's most prominent prevaricating serial philanderer. Memo to the Stone: The Rock of Peter doesn't roll.